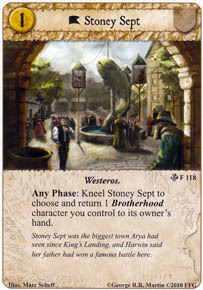 Flavor Text: Stoney Sept was the biggest town Arya had seen since King's Landing, and Harwin said her father had won a famous battle here. Can this card be used to take a character that is chosen to fulfill military challenge claim out of play before it is killed? No, this is an "Any Phase" action and as such can only be played during one of the player action windows. Any card that would be able to do that will be a response and have the word "save" in its text. See Kennel Master (Core) for an example. Trait manipulation, to return characters with useful enters/leaves play effects, such as Ser Jorah Mormont (WLL), The Viper's Bannermen (PotS) or Dale Seaworth (AToTT)?